All NDEI technicians are certified through outside organizations in Acoustic Emission Testing on Composites and Metal Vessels (MONPAC Certified). In addition to outside certification, all technicians are certified as per SNT-TC-1A requirements in Acoustic Emission Testing, Ultrasonics, Barcol Hardenss, Liquid Penetrant and Visual Inspections. Ultrasonic testing (UT) is a family of non-destructive testing techniques based on the propagation of ultrasonic waves in the object or material tested. In most common UT applications, very short ultrasonic pulse-waves with center frequencies ranging from 0.1-15 MHz, and occasionally up to 50 MHz, are transmitted into materials to detect internal flaws or to characterize materials. A common example is ultrasonic thickness measurement, which tests the thickness of the test object, for example, to monitor pipework corrosion. 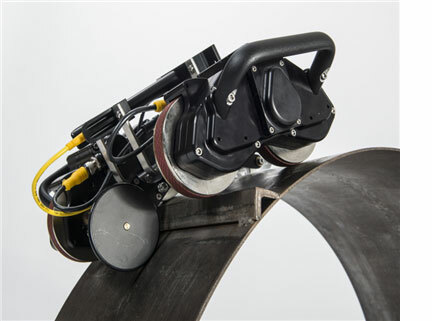 Ultrasonic testing is often performed on steel and other metals and alloys, though it can also be used on concrete, wood and composites, albeit with less resolution. It is used in many industries including steel and aluminium construction, metallurgy, manufacturing, aerospace, automotive and other transportation sectors. 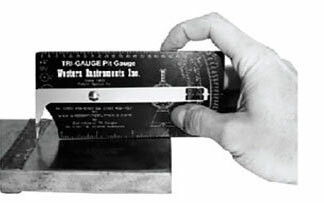 A Pit Gauge is an industrial tool widely used to measure the wall thickness of structures like plates or pipes. With this tool, plumbers, pipeliners, warehouse personnel, fabricators and even buyers are able to conduct proper measurements to determine the degree of corrosion. Any damage or deviation from normal measurements indicates a corrosion problem. 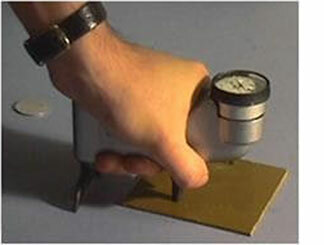 Hence, a pit gauge is a very important tool in corrosion inspection. Magnetic particle Inspection (MPI) is a non-destructive testing (NDT) process for detecting surface and slightly subsurface discontinuities in ferromagnetic materials such as iron, nickel, cobalt, and some of their alloys. The process puts a magnetic field into the part. 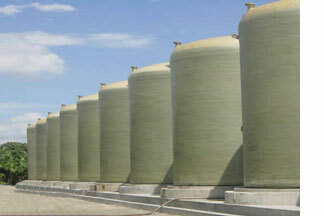 The piece can be magnetized by direct or indirect magnetization. Direct magnetization occurs when the electric current is passed through the test object and a magnetic field is formed in the material. 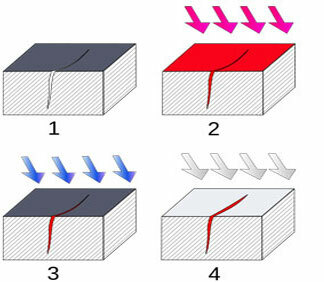 Indirect magnetization occurs when no electric current is passed through the test object, but a magnetic field is applied from an outside source. The magnetic lines of force are perpendicular to the direction of the electric current, which may be either alternating current (AC) or some form of direct current (DC) (rectified AC). The Barcol hardness test characterizes the indentation hardness of materials through the depth of penetration of an indentor, loaded on a material sample and compared to the penetration in a reference material. The method is most often used for composite materials such as reinforced thermosetting resins or to determine how much a resin or plastic has cured. The test complements the measurement of glass transition temperature, as an indirect measure of the degree of cure of a composite. It is inexpensive and quick, and provides information on the cure throughout a part. 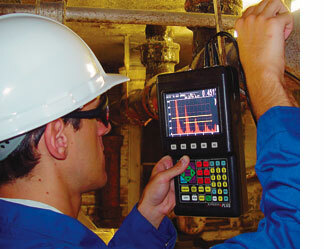 Remote Ultrasonic Inspection or Remote Digital Video Inspection, is a form of visual or other NDT inspection which uses specialized equipment including ultrasonic measurments and video technology to allow an inspector to look at objects and materials from a distance because the objects are inaccessible or are in dangerous environments. 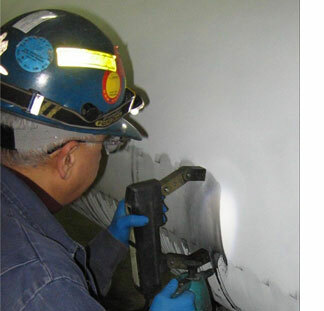 Remote inspection is a specialty branch of nondestructive testing (NDT). Remote Inspection is commonly used as a predictive maintenance or regularly scheduled maintenance tool to assess the "health" and operability of fixed and portable assets. 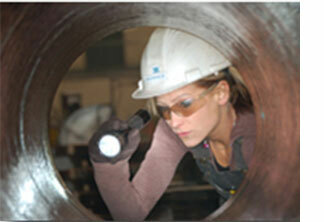 Remote Inspection enables greater inspection coverage, inspection repeatability and data comparison. The "remote" portion of this form of inspection refers to the characterization of the operator not entering the inspection area due to physical size constraints or potential safety issues related to the inspection environment.